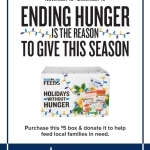 SALISBURY, N.C.--(BUSINESS WIRE)--Food Lion believes ending hunger is the reason to give this holiday season, and the grocer is making it easy and affordable for its customers in its more than 1,000 stores to help families in need through its Food Lion Feeds "Holidays Without Hunger" campaign Nov. 15 through Dec. 19. 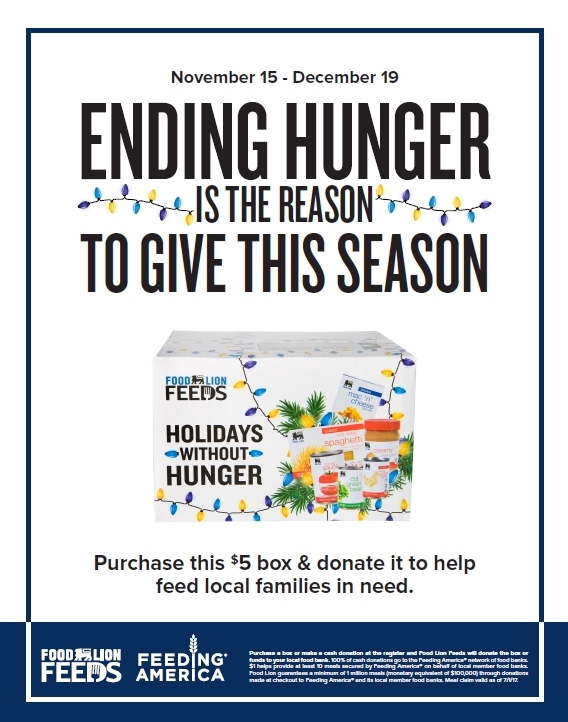 Through the campaign, customers can purchase and donate a specially-marked "Holidays Without Hunger" food box for $5, while supplies last, or make a cash donation at checkout. Food Lion Feeds is partnering with Feeding America®, the nation’s largest domestic hunger-relief and food rescue charity, for this campaign. One hundred percent of cash donations benefit the Feeding America nationwide network of food banks. All food boxes are donated directly to the local food bank or partner agency. Additionally, customers have the option to purchase and take the box home for their personal use. Through Food Lion Feeds, Food Lion is working to create a better tomorrow by uniting with customers and partners to help eliminate the difficult choices many families are forced to make when they are struggling with hunger. Working toward its commitment to provide 500 million meals by the end of 2020, Food Lion Feeds has already donated approximately 335 million meals* through in-store campaigns like "Holidays Without Hunger," its food rescue program as well as local donations and volunteerism throughout its footprint. 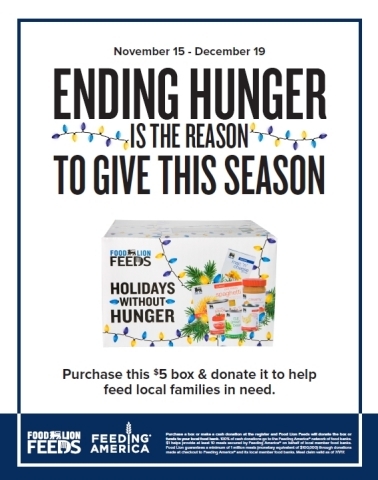 To learn more about Food Lion Feeds or the "Holidays Without Hunger" campaign, visit www.foodlion.com/feeds. *Meal equivalent based on combination of cash and product donations for the period between January 1, 2014, and September 30, 2016.